A tunnel fire of suspicious origins has occurred on the Sandy Valley & Elkhorn Subdivision near MP 6 at Robinson Creek, Ky. The blaze started Saturday evening, April 26th, and continues. The fire has isolated Premier Elkhorn’s mine at Myra. C&O Tunnel Data dwg. #20548 from 11-5-48 (revised ‘74) indicates the Robinson Creek Tunnel is 744 feet in length, all of which is timber lined. The tunnel was built by the B&O in 1912. On the way for a day at the Breaks Interstate Park yesterday, I noticed a DEEX (Detroit Edison) empty train parked at Fords Branch. 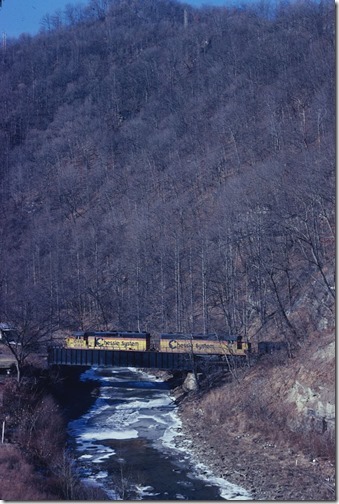 These trains usually load at Myra. I didn’t learn of the fire until last night. Sue and I went up there this afternoon after work. 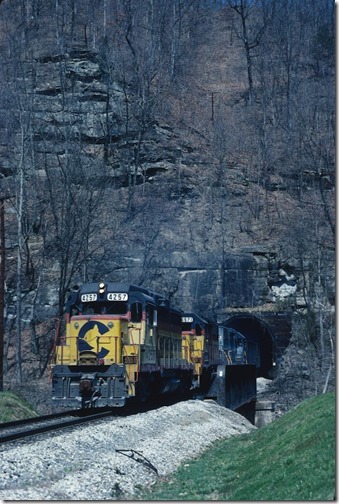 R. J. Corman crews and CSX are using hi-rail dump trucks to build a wall at the east (Douglas) end of the tunnel. A local fireman showed some photos made with his cell phone; Sunday evening the tunnel was an inferno! 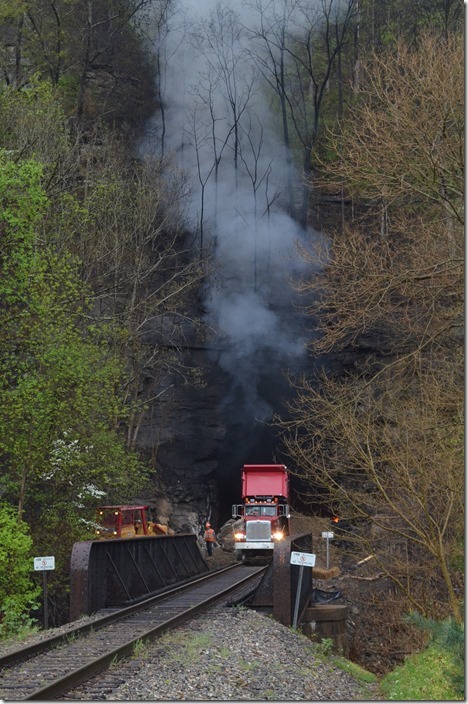 Because of dense smoke boiling out the the tunnel, Shelby Valley High School and Elementary School as well as their feeder schools were cancelled today. Below are some photos taken of the east portal late this afternoon. 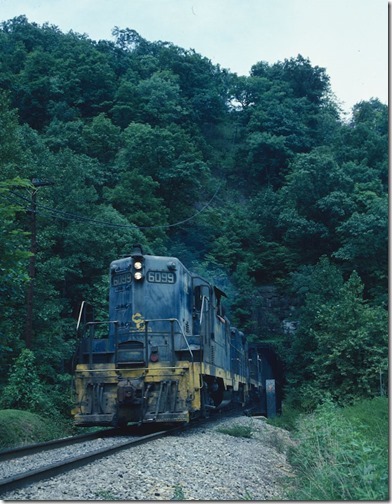 See page 14 of Appalachian Coal Mines and Railroads In Color – Volume 1: Kentucky for a photo of this tunnel in happier times. 1. 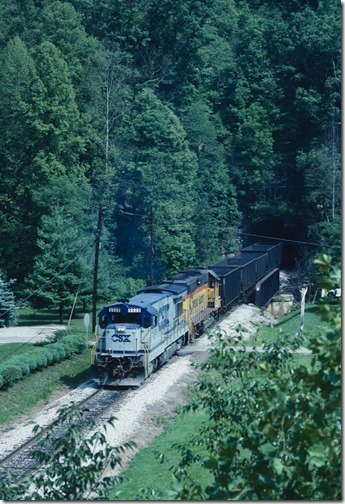 C&O 6205 on eastbound “Sandy Valley Shifter” with 96 empties. 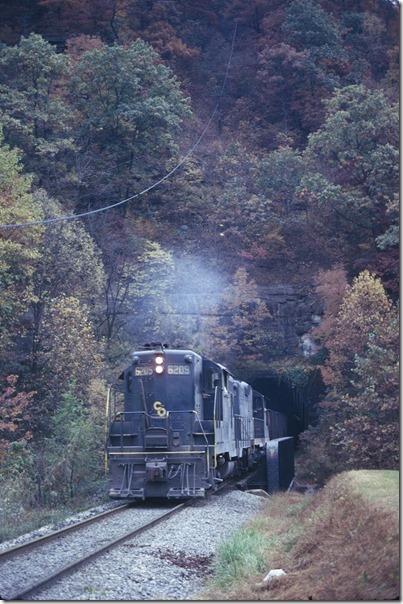 Robinson Creek Tunnel at Douglas, Ky. 10-13-1974. 2. C&O 6099-6253 on e/b “Sandy Valley Shifter”. 8-21-1977. 3. CS 4270 e/b. 8-2-1980. 4. CS 4168-3899 e/b. 1-18-1981. 5. 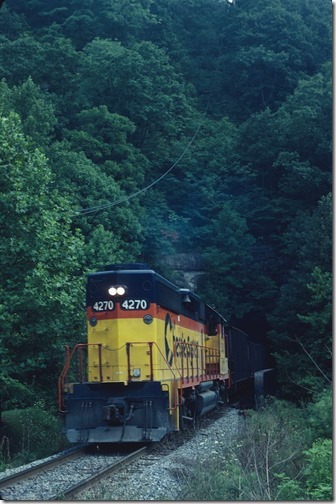 CSX 5508-6289 e/b. 8-14-1988. 6. CSX 4257-6571-2016 e/b. 3-26-1989. 7. 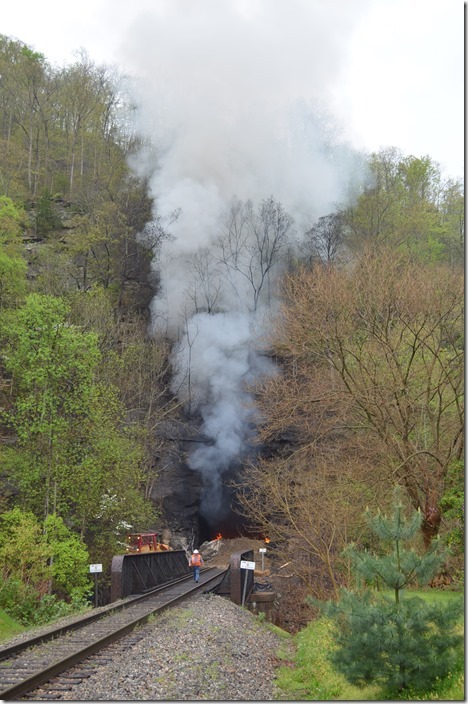 East portal of tunnel on 4-28-2014. 8. East portal of tunnel on 4-28-2014. View 2. 9. 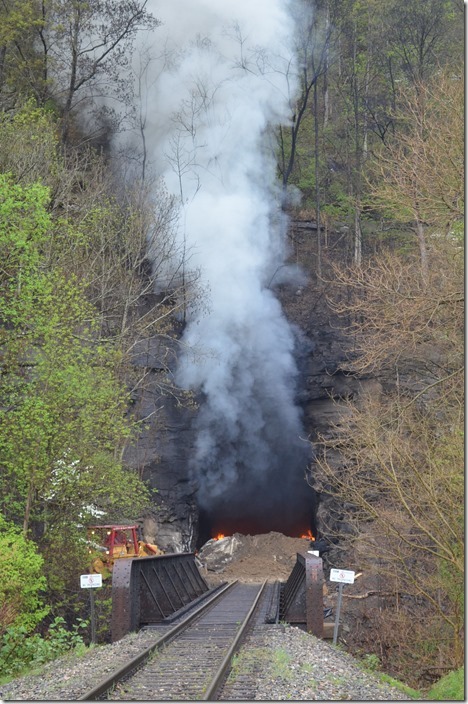 East portal of tunnel on 4-28-2014. View 3. 10. 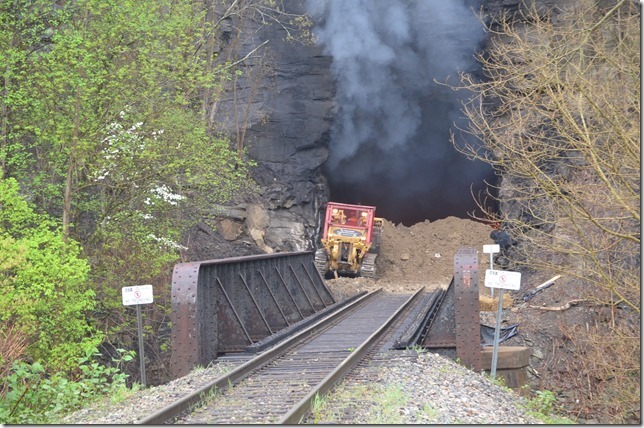 East portal of tunnel on 4-28-2014. View 4. 11. 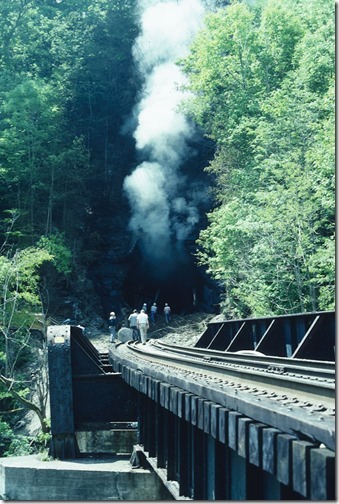 West portal of Virgie Tunnel burning on 5-7-1990. Three juveniles were arrested in this incident.